Barry Moore will serve as the grand marshal for Walterboro Christmas parade to be held in downtown Walterboro on Sunday Dec. 16 beginning at 6 p.m. The nighttime parade illuminates downtown Walterboro with festive lighting and holiday music coming from the many parade entries. The event draws a crowd, both young and old, and rings in the holiday for the City of Walterboro. In September, Moore retired from a 41-year career in the community newspaper business, most recently as publisher of The Press and Standard. He is a past member of the board of The Colleton Center, former chairman and current board member of the Walterboro-Colleton Chamber of Commerce; and serves on the Board of Trustees at Colleton Medical Center, the board of the Southern Carolina Regional Economic Development Alliance and is a member of the executive committee of the South Carolina Press Association. Moore and his wife Kris make their home in Walterboro and are the parents of six children and 13 grandchildren. 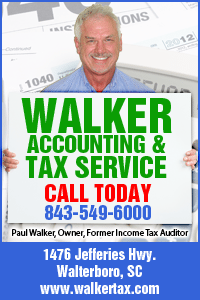 He is the chief operating officer for the companies owned by Walterboro businessman Paul Walker.